We've put up a little poll about the proposed freelancers' boycott of Transcontinental Media; you can give your opinion of it in the right sidebar or go to this link. "If you survived this downturn, why would you sell a newspaper now? These are very resilient newspapers. If you've survived this economy, you can survive anything. And there's a lot to be said for New York as a place to own a newspaper." [This post has been updated] Transcontinental Media has apparently dug its heels in over its proposed master contract, refusing to negotiate with representatives of the freelance community, who as a result are now calling for an "unprecedented" boycott of the company. A press release has been issued that gives detailed background on the dispute and details the organizations that are supporting the boycott. Derek Finkle of the Canadian Writers Group, an agency for writers, and David Johnston, executive director of the Professional Writers Association of Canada (PWAC) had been involved over the summer in discussions with senior executives at Transcon. But on September 1, Pierre Marcoux, the Transcontinental Media’s senior vice president of the business and consumer solutions group said the company did not intend to make any changes to the contract. "At the conclusion of our first meeting on July 16, they said they would be amenable to making changes. When changes didn't seem to be forthcoming after that, they finally announced at the beginning of this month that they were sticking with the contract as it was unveiled in June. "As a result, just about every Canadian writers' organization - agencies, associations, unions, alliances, and federations – have banded together in calling on writers across the country to stop writing for Transcontinental publications...."
"Taking action against contracts such as this is incredibly important right now. Showing that writers are united will also help when it comes to the evolution of contracts being used by other publishers. I can't stress how important I believe this effort is to the future of freelancing." The boycott is part of a wider campaign that includes lobbying the ministers of industry and heritage in Ottawa, launching a national petition, lobbying Transcon editors to intercede with their management on the issue, and undertaking a broad communications campaign, including letting advertisers know of Transcon's "heavy-handed attitude towards an important part of the cultural sector". It looks as though BusinessWeek magazine willsoon be sold by parent McGraw-Hill Cos. Inc. to Bloomberg LP. At least that's what its own senior management is hoping, according to a report from Reuters. A deal still could take weeks, or could fall apart because of depressed magazine advertising and uncertainty in the financing market; but BusinessWeek executives think that Bloomberg would be the best fit, the source said on Tuesday. Despite their positive feelings toward Bloomberg, the executives are not dismissing the possibility that another bidder could deliver a superior offer, the source said. The likelihood is, that if the news and financial data company was successful in taking BW, it would merge it with Bloomberg Markets, a feature financial magazine. 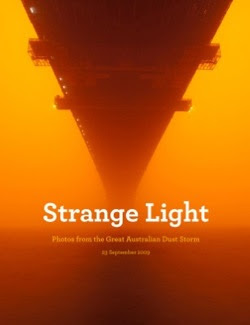 In a day and a half, Derek Powazek created a one-off magazine called Strange Light about the red duststorm that swept eastern Australia. He blogs about how he created the finished product, complete with 54 gorgeous photos (cleared with the photographers) in less than two days. We read about it in Nieman Journalism Labs. Quick turnarounds are not exactly new, with insta-books and special commemorative issues (for example, Michael Jackson's death). But usually those are repurposing and expanding existing, syndicated or archival content. The interesting thing about Powazek's mag is that it illustrates how digital production tools and small-batch printing can really cut the angle. Of course Powazek has a vested interest since he's involved in MagCloud with Hewlett-Packard, the system used to produce this special issue. But it is still very cool and should set publishers to thinking about customized editorial products that could spin out of their organizations without increasing overheads. I imagine the thing that will slow these products down is the difficulties of getting the printed product distributed. But with digital and online delivery, even that becomes manageable. Read Alberta Magazines Month is being launched on Thursday, October 1 from 5 to 9 p.m at Art Central, 100 - 7th Ave. SW in Calgary. The event is free and open to the public, with appropriate refreshments. There are events planned throughout the month of October and readers are invited to enter to win a Bellstar getaway to Canmore. 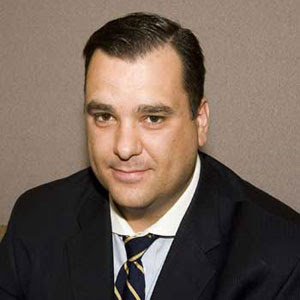 Federal heritage minister James Moore feels your pain, BC arts organizations, he really does. During the latest in a series of funding announcements, Moore said that the arts funding cuts by the BC (Liberal) government are potentially "devastating", he said according to a report in The Tyee. But after the press conference, the MP for Port Moody-Westwood-Port Coquitlam stopped short of directly criticizing the provincial government, saying he respects other governments' jurisdictions. "My job isn't to beat up on Kevin Krueger," he said of B.C. 's minister of Tourism, Culture and the Arts. "The province of British Columbia has made its own decisions and they will, politically, live with them." Moore was told by several BC arts groups about the impact of 90% cuts to their provincial funding. This impact is felt across the sector, including by a number of arts and culture periodicals. Core funding in BC -- most of which comes through the BC Arts Council -- is expected to fall 88% over two years, from $19.5 million last year to $2.25 million in 2010-11. When asked if cuts to provincial funding might limit federal funding for B.C. arts groups, Moore said his government is trying to compensate for funding that may be cut or absent in other Canadian jurisdictions. He also said while the Canada Council operates at arm's length from government, its administrators are quite cognizant of the impact that the disappearance of provincial funding in B.C could have. There are major changes underway at the venerable business title la revue Commerce as the editor of 7 years, Diane Bérard, is leaving her job at the end of the year and becoming a columnist for Commerce and lesaffairs.com. There is consideration of changing the name and perhaps publishing the magazine online only. According to a story in La Presse, the issue that will appear in December will be the last with the current look and feel. 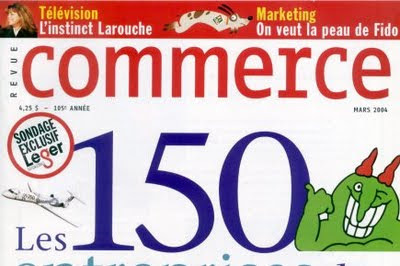 Commerce, which started out as a newspaper, became a magazine in the '50s and was acquired by Transcontinental Media in 1982. Berard is being replaced by Stephan Lavallée , head of the business publications group, who will be responsible for the redesign and repositioning of the publication. "The repositioning will involve looking at the publishing formula from one end to the other," said Lavallée, who said that more attention will be paid to its target audience and to distinguishing the magazine from other publications in the marketplace. This undoubtedly inclues its sister title les affairs. Details of the redesign and repositioning will be announced in about a month. It will probably include a beefed-up web presence and possibly moving the magazine online-only. The truth is that there have always been awkward "church and state" encroachments for journalists, even under the classic advertising model. In the extreme, publishers would demand favorable coverage for important advertisers, but on the fringes, there have been long-standing practices of publishing "special editions," advertorials, and other custom content that effectively touted the products and services of advertisers in their pages, but not technically under the imprimatur of their journalistic brands. -- Joe Mandese, in an article in Media magazine, exploring the relation between the "free versus paid" argument and the "church and state" separation of ad and editorial. NOTE THAT editor Kevin Vander Linden has informed us that he continues to publish as before. We regret the error. Word is that Goats Across Canada magazine has been discontinued. The magazine was published out of McBride, B.C., by Summer Waters Farms Ltd. and its owner, publisher and editor Kevin Vander Linden. The monthly had a circulation of 1,700 and was dedicated to promoting the goat industry in British Columbia and across the country, with information about goats, breeds, breeders, health and shows, natural health recipes and information about the benefits of goat products such as soap, milk and fibre. There is one other Canadian goat-related title, the 10-year-old bi-monthly GoatKeeper Magazine, published out of Hay Lakes, Alberta by Rise and Shine Press. Most of its circulation is through subscriptions purchased via provincial goat associations. The Ryerson Review of Journalism is a truly precious resource; if it didn't exist, the industry would have to invent it. Right now, the Review is wrapping up an online survey of its readers, and is conducting a wider, companion survey of people (mostly in related fields) who aren't necessarily RRJ readers but are interested in the topics the RRJ covers. They've asked us to make people aware of this companion survey. Underline Studios has won a 2009 Ontario Associaton of Art Galleries award for its design of Prefix Photo 17: The Last Photograph. The publishers, Prefix Institute of Contemporary Art, also won for art book of the year for Milk and Melancholy, written by Kenneth Hayes and edited by Scott McLeod. Underline also designs U of T magazine, Rotman magazine and Precedent. CORRECTION: Apparently the term "assignment" in the notice of settlement in the Robertson case refers to 3rd parties to whom rights may have been "assigned", not the assignment by the editor of the story, photo or illustration work. Claimants under the class action need only fill out the claims form and specify the work that they were responsible for. We regret the error and any confusion it may have caused. Make your claims. This is good news for freelancers, particularly ones who don't have written proof of the order from the magazine or newspaper. The drawn-out class action over copyright in what has become called The Robertson case is winding its way to a conclusion in which the best possible outcome will be a series of payments to freelancers and others who make a claim...provided they kept tidy and complete files. The notice of the settlement was published in the Globe and Mail September 19. The accompanying claims form makes it clear that writers, photographers and illustrators claiming a share will need to provide written proof. For many freelancers, that may be harder than it at first seems since they are not only required to provide information about the articles or work, where and when each was published, and the length or nature of the work but, according to the claim form, also the original written assignment. Since many of the possibly eligible articles may go back 15 or 20 years or more, the likelihood of having a copy of an original assignment letter for articles or illusrations from an editor (even assuming there was anything more than verbal instructions) seems remote. The suit was launched more than 13 years ago by Heather Robertson on behalf of thousands of freelance writers claiming their work was reproduced electronically without proper permission or compensation. In May, the defendants agreed to pay $11 million to settle the class action suit. The defendants were The Thomson Corporation (now Thomson Reuters Corporation), Thomson Reuters Canada Limited, Thomson Affiliated and Information Access Company (formerly The Gale Group Inc. and CTVglobemedia Publishing Inc. (formerly Bell Globemedia Publishing Inc.), the publishers of the Globe and Mail newspaper. Effectively, however, this means there will be something like $4 to $5 million in compensation available to individual writers, photographers and illustrators for freelance work published prior to May 1, 2009 in various newspaper databases. Unspecified donations to the Professional Writers Association of Canada (PWAC), the Writers' Union of Canada and the Canadian Association of Photographers and Illustrators in Communications (CAPIC). The awards to individual writers, photographers and illustrators will be based on a points system calculated on original fee paid for the work, the length of the work, and the publication in which the work first appeared. Alternatively, they can forego compensation and ask for their work to be taken down from Globe websites. Writers who want to opt out of the settlement (thereby presumably retaining their right to sue separately) have to indicate this by no later than November 2, 2009. Those who wish to file a claim must do so prior to January 18, 2010. 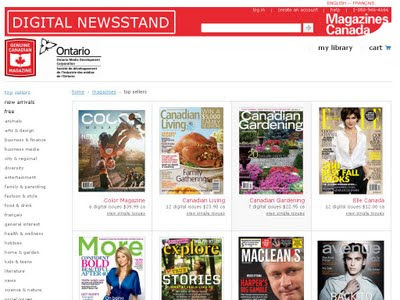 Magazines Canada is today launching the Magazines Canada Digital Newsstand, powered by Zinio. It is a bilingual site where people can subscribe to digital editions of a whole range of Canadian titles. Among the other titles available digitally are Alberta Venture, The Beaver, Breathe Magazine, Style at Home, Canadian Living, Chatelaine, Elle Canada, Geist, The Hockey News, Homemakers, LouLou, More, Saltscapes, SkyNews, Style at Home, The Walrus, Wine Access, Zamoof!. More consumer titles are expected to be added regularly, and a business media newsstand is in development. This project was made possible with the support of the Ontario Media Development Corporation as part of the Entertainment and Creative Cluster Partnerships Fund. Alan Webber of Fast Company magazine will be speaking Tuesday, October 13, 2009 from 5:30 PM - 8:00 PM (ET) at the Centre for Social Innovation, 215 Spadina Avenue, which is co-hosting the event with MASS LBP. The event is free, but these talks are often packed, so it's best to RSVP to http://alanwebber.eventbrite.com. The editor, columnist and author co-launched Fast Company, the fastest growing, most successful business magazine in history and winner of two national magazine awards, one for excellence and one for design. 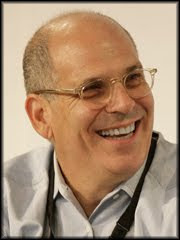 He was named Adweek's Editor of the Year in 1999, along with co-founding editor William Taylor. In 2000 Fast Company was sold for the second largest amount of any magazine in U.S. history. Webber is coauthor of three business-related books, including most recently, Rules of Thumb: 52 Truths for Winning at Business Without Losing Your Self. Friday fun. [Thanks to SPD for letting us know about this] A site where you can test your knowledge of fonts...and cheese...and the differences between them. You can do a scored test or a random, unscored quiz that is work-avoidance of a high order. See if you know your Gouda from your Goudy. Valerie Maloney is the new editor of Masthead, the online site about the Canadian magazine industry. She succeeds Marco Ursi, who recently left to return to school to become a teacher. Masthead says that Maloney was an associate editor at CLB Media, working on five b2b titles and various websites and is a graduate of Humber College's posts-grad journalism program. She also holds a psychology degree from the University of Waterloo. According to a profile on a Humber site her writing career began when she was published in Reader's Digest at the age of seven. In addition to editing Mastheadonline, Maloney will be a print reporter for sister sites PrintCan.com, serving the printing industry and DesignEdgeCanada.com, covering the graphic design industry. She can be reached at vmaloney@masthead.ca. The Society of Environmental Journalists is hosting one of its periodic pub nights to hear from Thomas Pawlick, author of The War in the Country: How the Fight to Save Rural Life Will Shape Our Future. Pawlick is a former editor of Harrowsmith magazine and a small-scale farmer in Eastern Ontario. The SEJ is the only North-American membership association of professional journalists dedicated to more and better coverage of environment-related issues. The pub night is spearheaded by indefatigable freelancer Craig Saunders and people who are to attend are strongly urged to RSVP to SEJpubnight@saunderseditor.com. Canadian Literature, a journal published out of the University of British Columbia, is celebrating 50 years with a gala celebration, a two-day conference, public lectures and an appeal to create a tuition fund for interns at the magazine. The journal's first issue was published in1959 (its founding editor was George Woodcock), and in the 200 issues since it has published many of the best-known names among Canadian authors, including Alistair MacLeod (No Great Mischief); Yann Martel (The Life of Pi); Michael Ondaatje (The English Patient); Carol Shields (Stone Diaries, Larry’s Party). The gala is at the UBC Museum of Anthropology on Thursday, October 1, starting at 7 p.m. followed by benefit auction of art donated by Leonard Cohen, Joni Mitchell and Margaret Atwood at 8 p.m. at Sage Bistro. The gala will also feature the launch of a new book, From a Speaking Place: Writings from the First 50 Years of Canadian Literature, published by Ronsdale Press, as well as Sherrill Grace’s, On The Art of Being Canadian, published by UBC Press. During the Gala, Canadian Literature hosts a two-day workshop with academics from 21 universities meeting to discuss the future of Canadian writing and the future of scholarly journals. Workshop participants will tackle questions about publishing and the role of arts and culture in discussions of the environment, ethnicity, gender, poetic experimentation, global citizenship and aesthetics. What, they will ask, might the future look like? The image on the 30th anniversary poster for the National Magazine Awards has found new life as the cover of the about-to-be-released collection by Stuart "Vinyl Cafe" Mclean, Extreme Vinyl Cafe. Who was the illustrator? [This post has been update]Magazines University -- or Mags U as it has come to be called -- is being discontinued by its current owners, the Canadian Business Press (CBP) and CBP is becoming a full partner in MagNet, the annual conference led by Magazines Canada from 2010 and beyond. The change has come about after long discussion between the board of CBP and the MagNet managment team. CBP will be represented by two publishers on the curriculum development committee and will play a key role in the development of future conferences. CBP joins the other MagNet organizational partners which are the Canadian Society of Magazine Editors, Circulation Management Association of Canada, Magazines Canada and the Professional Writers Association of Canada. MagNet 2010 happens at 89 Chestnut, June 1-4, 2010. The MagsU brand was purchased by CBP in November 2008 from North Island Publishing (Masthead) after the company decided to stop publishing a print edition. It had been managed by Masthead for several years in collaboration with CBP and before that had been operated by a consortium of industry groups, led by Magazines Canada and Masthead. In 2006, Magazines Canada left the consortium and started its own June conference called MagNet. Both conferences were held the same week, both said they served both the consumer and b2b publishers and it was widely assumed that only one of the conferences would survive. CBP ran the first MagsU on its own in June 2009, but it is understood that it was not a financial success. Most industry observers felt that the Canadian industry -- even in good economic times -- could not realistically maintain two, rival conferences. Circumstances have also changed in that in June 2008, Magazines Canada began to accept business-to-business magazines into membership and in November, 2007, the largest trade publisher in Canada, Rogers Publishing, decamped from CBP taking 36 English and French titles with it. It joined Magazines Canada in 2008. Vanity Fair, Sports Illustrated and Harper’s Bazaar were among the ten magazine covers chosen by Amazon.com customers as “Best Magazine Cover of the Year” in their respective categories, the American Society of Magazine Editors have announced. According to a story in Audience Development, this is the first time ASME has had consumers, rather than ASME members, choose the winners and it was done through the online bookseller's poll of its visitors. Magazine covers were eligible if they appeared in issues dated from June 1, 2008, through May 30, 2009. More than 100,000 votes were counted. A second round of public voting now through September 30 on www.amazon.com/bestcovers, will pick “Best Cover of the Year” among the 10 category winnersto be announced by ASME President David Willey on Oct. 14 at the Magazine Innovation Summit in New York. Perhaps the commuting finally got to him. Marc Blondeau, the senior vice-president, consumer publishing and président, Les Éditons Rogers – Québec, will be leaving the company on October 16th, according to a story from Mastheadonline. He has been with the company for nine years and for most of that time has been splitting his time between the Toronto campus and the Montreal offices. The story said Blondeau has met with his management teams and staffs in both places in the past 24 hours to talk about his decision to leave. Suneel Khanna, senior director of communications for Rogers Consumer Publishing would not say if Blondeau's position will be replaced or if a successor has been named. In an internal memo obtained by Masthead, Brian Segal, president and CEO stated that Blondeau's passion, competence, sense of humour and his abilities as a remarkable manager and colleague will be missed. "I want to thank him personally for his leadership, numerous accomplishments and many successes during his nine years with the company," said Segal in the memo. "It is under his tenure that were regrouped all of our consumer magazine brands in Canada within a new division that has permitted us to strengthen and grow our position and to launch new successful brands such as LouLou and Hello!" The first issue of the newly rebranded Coastlands: The Maritimes Policy Review (formerly Nova Scotia Policy Review) is now out and in it the magazine found a clever, cheeky way to deal with any (unlikely) reader dissatisfaction with the new name. George Orwell has been graciously answering questions about political culture and local media since this magazine began life as The Nova Scotia Policy Review. This letter is from a gentleman who has struck up a correspondence with Mr Orwell over the years. I have to report that my favourite magazine has gone and changed its name. It used to have a nice dry title and now it has a sultry name. What could it possibly matter what it’s called so long as it’s a good read? If you remember, my name used to be Eric Blair. Well, it beats the heck out of "Novink", which was a contender for the renaming of the former Quebecor World magazine printer. World Colour Press of Montreal has introduced its new name and logo, effective immediately. It will be all over the company's website worldcolor.com (note the American spelling). I asked some of my European friends if the internet was killing the newspaper and magazine business there like it was in the States and they looked at me like I was insane. What [Michael] Moore says is correct -- American publishers have been giving readers less content and turning them off, while conveniently blaming the internet for their troubles. -- from a comment on the Hollywood Elsewhere blog, about Michael Moor's response to Tina Brown about the future of "old media". 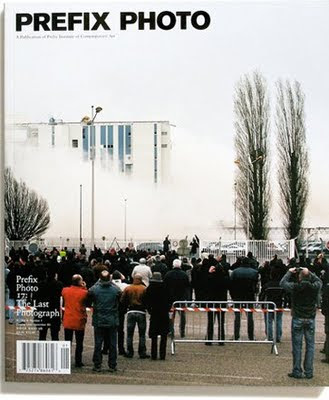 It was surprising last year when Domino magazine was folded just how many people were passionately devoted to it and lamented its passing. Sort of "you don't know what you've lost 'til it's gone". Well, Domino fans can take heart that a former Domino editor is launching an online-only magazine that, while it won't replicate the late title, will carry on its spirit. According to a story in Women's Wear Daily (WWD), Michelle Adams and partner Patrick Cline will launch Lonny, a name combining New York and London, on October 1. “Our goal is not to replace Domino, as there will clearly never be a replacement, but rather to help fill the void that has been left by so many closing shelter publications and help bridge the gap between traditional print magazines and the online world,” Adams said. With the structure and pacing of a print magazine, using a "flip" format, the first issue will, among other things, feature former Domino editor in chief Deborah Needleman in her garden. The format will let readers “flip through pages,” much like a print magazine, and readers will be able to shop directly from the pages by clicking on items. “We literally have had everything from the photo equipment to the writing donated by people who believe in what we’re trying to achieve,” said Adams. “Our hope is that the magazine will grow and that we’ll be able to employ these people for future issues.” Adams said the first issue will have advertising from Fotocare and Digital Media NYC. The Rotman School of Management at the University of Toronto and the Canadian Journalism Foundation are together launching an executive program for media management. The Media Management Executive Education Program (MMEEP) is believed to be the first such certificate program for journalists in Canada. The three-day residential program will be held from October 23- 25, 2009 at The Bank of Montreal's Institute for Learning in Toronto and can accommodate up to 30 registrants. Deadline is September 30, 2009. The fee is $3,500. The program is intended for news media executives with a minimum of 8 to 10 years of experience working in print, broadcast and online outlets who need to manage across departments or media platforms. The curriculum will focus on core business concepts including leadership, strategy, finance, operations, negotiation and decision-making. 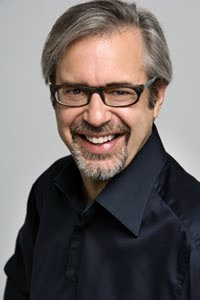 As part of the curriculum, Douglas Knight, the president of magazine publisher St. Joseph Media (Toronto Life, Fashion, Wedding Bells, Canadian Family etc.) will share a panel with Phillip Crawley, publisher and CEO of the Globe and Mail and Barbara Williams, executive vice-president of content at CanWest Broadcasting. In addition participants are promised "experiential exercises, team-based learning, role plays, discussion circles, case studies, presentations, lectures, group and team-building exercises, as well as frequent opportunities for informal interaction and discussions." "This is an innovative and timely collaboration on the part of Rotman and the CJF, bringing the benefits of professional management education to media's new leaders as they prepare to face transformational challenges and exciting opportunities," said Doug Knight in a release. Here's a good rainy day project. The magCulture blog has published a Google map of the best magazine stores in London. Maybe a project for the next couple of months would be to do a Canada-wide map of the best magazine stores in each city. You send me the stores and their addresses, I'll compile the map. Ian Brown, a frequent contributor to Canadian magazines and an acclaimed broadcaster and author, has been appointed Rogers Communications Chair for the Banff Centre's literary journalism program. Brown, who is a staff writer for the Globe and Mail in Toronto, is the author of the recently published non-fiction book The Boy in the Moon, about his relationship with his son, who suffers from a rare genetic disorder; the book was based on a series Brown did for the Globe. In June, Brown won his 12th gold award at the National Magazine Awards in the short feature category. The literary journalism program at The Banff Centre, which has been running for 20 years, brings eight accomplished nonfiction writers to Banff every summer for intensive workshops and mentorship. In many ways it is an amazing commitment to long-form journalism. Each participant spends several weeks refining and polishing a feature story or essay with help from guest writers, and faculty editors. The faculty mentors have included some of the very best Canadian journalists, including Mark Abley, David Hayes, Rebecca Solnit, Taras Grescoe, Charlotte Gill, Myrna Kostash, and Philip Marchand. Cabin Fever, the latest collection of work done in the program, will be published this fall by The Banff Centre Press and Thomas Allen Publishers to honour the program’s 20th anniversary. Toronto Life has succeeded in its drawn-out struggle to have its brand name removed from the downtown Toronto building that is now being called 10 Dundas East. What had been Toronto Life Square (which was not a square, but a commercial mall) at the northeast corner of Yonge & Dundas, now has bland signage saying 10 Dundas East or nothing at all, according to a story in the Globe and Mail. The building was placed in court-ordered receivership this spring after its owners, a subsidiary of PenEquity, could no longer finance their $280-million in debt. At the same time Toronto Life magazine's parent company, St. Joseph Communications, was locked in a court battle to have the magazine's name removed from the project. That process now looks complete. “St. Joseph Communications was successful in winning the arbitration with PenEquity, so our name is no longer associated with that space,” St. Joseph's spokeswoman Marta Sinyard said in an e-mail yesterday. Toronto Life logos on billboards, doors and elevators have disappeared, replaced in some cases by large black rectangles that resemble the redaction boxes that hide sensitive information on government documents. Building staff who used to wear Toronto Life logo shirts are now wearing plain grey shirts, according to a clerk who works in the complex, and video screens now flash a purple 10 Dundas logo. Only the website, www.torontolifesquare.com – and signs in the TTC's Dundas subway station – continue to boast the stylish red Toronto Life logo. A company-wide cost savings drive at Condé Nast has spared all of its titles for at least a year, according to a story from the New York Post. But it will cramp the style of some of the most prominent editors, who will either forego foreign junkets or stay at less glam hotels. McKinsey & Co. prepared a belt-tightening report for Conde's senior management which nevertheless apparently keeps all brands intact, including Vogue, Glamour, Vanity Fair, In Style, Teen Vogue, Allure and Details. The fuzzy alliances of web publishing and advertising, particularly by established print publishers, is illustrated by the recently announced cooperation between Reader's Digest Canada and Kraft Foods. Not that these companies are exceptional, but a release from Reader's Digest highlights their close connection of the editorial and advertising functions online. If a church and state divide exists at all online, it seems to be becoming a paper-thin one. 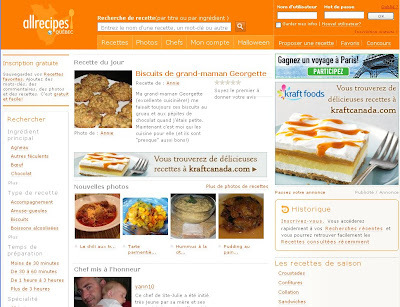 Reader's Digest has announced the launching of the French-language version of Allrecipes.com, called Allrecipes.qc.ca. The new site, says the release, features localized content, language and measurements for home cooks in Québec, similar to that on the Seattle-based Allrecipes (part of the Food & Entertaining RDA, a division of The Reader’s Digest Association, Inc., which attracts about 2 million visits monthly from Canada, 150,000 from Quebec. Worldwide, the site gets about 12 million monthly visitors, with localized versions in United Kingdom/Ireland, Australia/New Zealand, France, Germany and Japan. Allrecipes’ distinctive user-generated content and social networking platform provide advertisers with a dynamic advertising vehicle, enabling them to reach a highly active and engaged audience of primary household decision makers at their immediate time of need at a time when consumers place the highest level of trust in peer opinions. The seamless integration of branded content into the site’s daily food conversations, members’ recipe ratings, reviews and photos generate powerful results for participating brands to deliver contextual relevance in a trusted and captive environment [my boldface]. Advertising sales for the new site will be handled by the Reader’s Digest Ad Sales and Olive Media. "Captive environment" and "seamless integration of branded content", indeed. "We do not feel we are crossing any ad-edit guidelines with this site, the first of its kind in French Canada. As you know, this is a reader-contributed web site posting recipes. The source of any posting is clearly mentioned at the top of any item. For example, the «Saumon en croute» recipe that was online today comes from Kraft Canada and was so labelled in the source field right below the title. When you clicked on that recipe, you moved to the recipe page where another disclosure was added: sponsored by Kraft Canada in two prominent places. I do not believe customers can confuse this with recipes from other members, also clearly identified. The idea behind the ad-edit guidelines is to make sure there is no confusion in the customer's mind. I think we achieve that clarity on the French Allrecipes site. This is not a site with a great diversity of genres, with features and departments that have to be designed to accommodate advertising. We are creating an environment that allows for clearly-labelled advertising content on its pages." M. Goyette contends that significant safeguards are built in and that readers won't be confused. One nevertheless wonders if this site is a symptom of what is to come. Not all the Allrecipes versions internationally have such a tight sponsor relationship. In the UK and Australia/New Zealand, there is no evidence of it. But in Germany advertisers actually sponsor individual recipes. If multi-media publishers move to a low common denominator in terms of ad:edit integrityonline, my concern is it will reduce to gossamer the distinction between paid hustle and legitimate editorial. Am I worried about nothing? Research for the American Press Institute has found a real gulf between newspaper publishers who think the public will pay for online content and those who aren't so sure. As reported in Allan Mutter's Reflections of a Newsosaur blog, only 51% of publishers think pay walls will fly. The other 49% either fear that pay walls will fail or just aren’t sure. The research was carried out with 118 papers of all sizes across the U.S. and 4,000 consumers were polled separately online by a number of papers. While 68% of the publishers responding to the survey said they thought readers who objected to paying for content would have a difficult time replacing the information they get from newspaper websites, 52% of polled readers said it would be either “very easy” or “somewhat easy” to do so. The Print Measurement Bureau (PMB) has announced that the results of its first-ever biannual release will be made on October 6. The twice-yearly release (spring & fall) is intended to give subscribers the most up to date and timely readership, product and brand data demographics, lifestyle and psychographic information. "Reactions to the move to biannual release has been very favourable across all sectors of the media industry," Steve Ferley, president of PMB, told Media in Canada. "All sectors recognize the need for data suppliers to be as current and up-to-date as possible with their deliverables. This move is intended to add frequency to the reliability." The owners of Canadian Poker Player magazine are about to launch a 24-hour online poker television channel. According to a story in Poker News Daily, HeadsUp Entertainment has announced it intends to launch CanadianPokerPlayer.tv later this fall. “Some of the programming for the station will include over 20 hours of content produced in Canada over the past four years from the Canadian Open Poker Championships in 2006, 2008, and 2009 from Calgary. We are currently working with several of the online poker sites to include programming from around the world that they have produced as well." In addition to poker-playing, the online channel will include movies and features relating to the poker and gaming industry, Kellner said. Canadian Poker Player magazine was purchased and revived by Calgary-based HeadsUp in 2008 after being suspended by its previous owners, BC-based Fifth Street Publishers. The minister of Canadian Heritage, and by extension his department, can at least be given points for their consistency. Recently, as a result of a review process, Heritage has decided to terminate a program that supported independent performers and small scale independent music-making in favour of support for enterprises that are considered more commercially marketable. If this sounds familiar, it is essentially the same process and outcome as has occurred in the periodicals industry; small literary, arts and cultural magazines being cut adrift if their paid circulation is less than 5,000 annually. “The envelope they were looking for was basically to fund artists who have no interest in developing any kind of commercial opportunities for their music, that's just a different approach than what we have in mind,” Moore told the CBC. Moore said yesterday the Conservatives' philosophical inclination is toward funding artists with commercial promise, a view Prime Minister Stephen Harper has espoused. “But not entirely,” Moore added. So, to paraphrase, it's not minister Moore's view that commercial viability is synonymous with excellence, but commercial projects are all the government wants to invest in. (As an aside, the musical diversity program, which is being cut, was administered by the Canada Council. This doesn't augur well for the one, small hope being nurtured by small literary, art and cultural publishers -- and Magazines Canada. They have been hoping that Heritage might somehow agree to shift some of its periodical funding over to the Council -- equivalent to the $1 million SALM (Support for Arts and Literary Magazines) portion of the Canada Magazine Fund -- as part of its merger of the CMF and the Publications Assistance Program into the Canada Periodical Fund next spring. Does the government want to treat small mags and readers like cockroaches? Canadian Living magazine is launching a competition for Canadian journalism students to earn cash prizes, publication in Canadian Living and on CanadianLiving.com, and to secure a 12-week editorial internship with the magazine in Toronto. The Canadian Living Journalism Prize is open to current, full-time journalism students at a Canadian college or university. Applicants are asked to submit a completed application package and to make a pitch for a "perfect Canadian Living feature story". The two, 12-week internships (May 25, 2010 to August 13, 2010) are themselves unpaid, but the two grand prize winners are awarded $1,500 as well as being published. Two second prize winners will receive $500 and be published. Two third prize winners will receive a $200 prize and be published. The magazine says that it is proud that a number of former interns are now staffers. Far from being underused coffee-getters, Canadian Living interns actively participate in the research and writing process and gain valuable experience working in a busy editorial environment. The winners of the Canadian Living Journalism Prize, who are awarded the 12-week internship, will receive the opportunity to research, write and fact-check stories, and will be encouraged to pitch their own story ideas. Interns will also have the chance to research, edit and produce content for CanadianLiving.com. Creative industries band together with statement on copyright opposing "fair use"
Some 45 organizations in Canada representing the creative industries have submitted a joint statement to the current federal consultation process on copyright reform, asking the government not to implement the concept of "fair use". The stance, not surprisingly, runs counter to the position taken by many of the advocates of fair use. The signatories include such magazine-related organizations as Magazines Canada, the Professional Writers Association of Canada (PWAC) and Société de développement des périodiques culturels québécois (SODEP), Access Copyright, the Canadian Copyright Licensing Agency and the Canadian Freelance Union. Other organizations represent the book, music and games industries. The paper essentially asks for a continuation of the longstanding "fair dealing" provisions now included in the Copyright Act and asks that the government reject calls for changing this to "fair use" or an "expanded" fair dealing definition that would create an open-ended system leaving copyright holders guessing about the junction between their right to be compensated for their work and the right of users to download, copy or sample the work without payment. "'Fair use' has been described as an 'astonishingly bad' system amounting to little more than 'the right to hire a lawyer' [said the statement] "Fair use and/or expanded fair dealing systems are models that many of our trading partners including the United Kingdom, the European Union, Australia and New Zealand have expressly rejected." Fair use would lead to uncertainty, increased litigation, and reduce revenue available to creators and the Canadian creative industries, the submission said. It would also make collective licensing more difficult, if not impossible, as practiced by more than three dozen organizations in Canada (for instance, royalties charged by music publishers or for photocopying of printed works). And it could possibly invalidate current levies on media and photocopying that are imposed to pay royalties to Canadian copyright holders. Two of Maclean's magazine's lead columnists -- Andrew Coyne (right) and Paul Wells -- say they know how to fix Canada's "broken democracy". One way is to square off in this week's issue of the magazine. Another is to hold a roundtable discussion with guests former NDP leader Ed Broadbent, former prime minister's chief of staff Eddie Goldenberg and author John Ralston Saul. The roundtable is at the St. Lawrence Centre for the Arts, John Mallett Theatre, 27 Front St. East, Toronto on Wednesday, Sept. 23, 7 p.m. to 9 p.m. Tickets: $15 to $20. Fashion magazine is giving away to readers everything featured in their October issue - from clothing to makeup -- between September 21st to October 16th. There’s quite the mass of excellent merch up for grabs; among the mass is a Dsquared dress, Pink Tartan skirt suit, Mackage coat and a buttload of designer makeup and hair care products. The main coverline of the shopping issue (isn't every issue a shopping issue?) says "Win (Almost) Everything in This Issue!" and the magazine's website says there are 1,750 items for grabs. "We've been really concerned. Our preference would be to have the level of coverage of science and research that we enjoyed for decades," said Lisa Lapin, assistant vice president for university communications at Stanford. "But the major news organizations haven't had the resources to provide that independent, objective look at what we are doing. It's been declining." Major cuts in newspaper advertising dollars have resulted in significant cuts in space and coverage. 20 years ago nearly 150 U.S. newspapers had a science section and today fewer than 20 do, concentrating on health and lifestyle coverage. Every week, participating universities now send several news releases and articles written by university staff members to an editor at the University of Rochester. 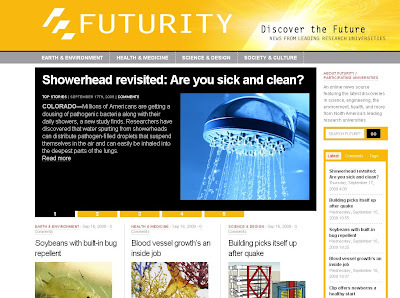 The editor then highlights stories on a Web﻿ site, futurity.org, to showcase the research. Not only is Wal-Mart moving magazines to the back of its stores, its "Project Impact" remodeling program will actually decrease the space devoted to magazines and reduce the number of authorized titles, based on profitability and sales. According to a story in Audience Development, the major magazine retailer is reducing mainline space by 20 feet -- about half of what it was previously -- which leaves about 210 magazine titles on display. Those numbers may vary from store to store and final counts are still under consideration—estimates place the number of titles Wal-Mart carries across its chain at 2,000. Mike Porche, president, Distribution Services, Inc., told AD that Wal-Mart is in the process of reviewing the list of titles that are carried in “Project Impact” stores and is looking to remove any titles that are deemed “unprofitable and low-selling,” but that the company has yet to determine the number of titles that will remain on the aisles. Dennis Porti, the president of Curtis Circulation LLC, one of the biggest U.S. distributors, say that because magazines are impulse driven, the combination of fewer magazines in less space at the back will inevitably reduce sales. The story pointed out that magazines will continue to be sold at checkout lanes, even though the mainline is being relocated. [This post has been updated]Duncan Hood, formerly a senior editor at Maclean's, has been named to the double-barrelled job of editor of MoneySense magazine and a* managing editor of Canadian Business. Word came in a message to staff from publisher of all three magazines, Ken Whyte. His appointment to both jobs is consistent with a recent trend at Rogers Publishing with senior editorial managers taking on multiple responsibilities. First, Ken Whyte was named both editor and publisher of Maclean's. Then in a major shakeup, Whyte took over as publisher for all the news and business titles, including Maclean's, Canadian Business, MoneySense and Profit. This week it was announced that Christine Dewairy, the art director of Maclean's, will be responsible for design at all four publications. Prior to being at Maclean's for the past year, managing special packages to writing and editing business features, Hood had been a features editor at MoneySense for four years, during which time he won five National Magazine Awards—three golds and two silvers—in the personal finance category. He has degrees in journalism and physics and completed the Canadian Securities Course. In other moves at Canadian Business, Pat Ireland, Robert Near, and Annette Boudreau have been laid off as associate editors (fact-checkers). Kasey Coholan and Jacqueline Nelson remain as associate editors. This, too, is consistent. Soon after Whyte took over at Maclean's, the previously rigorous fact-checking department was essentially done away with. Several editorial positions at Canadian Business have been filled, including deputy editor Lianne George, senior writer (Calgary) Tony Seskus, deputy art director Una Janacievc and cover designer Jason Logan. For the Conde Nast circulation boffins in Britain, there was good news and bad news. The good news was that their subscription promotion for House and Garden magazine went quite well, exceeding expectation by 50%. The bad news, according to a story in the Press Gazette, was that they ran out of the advertised premiums -- Molton Brown toiletries -- and tried substituting other things (in this case, a notebook). As a result, they got their knuckles rapped. 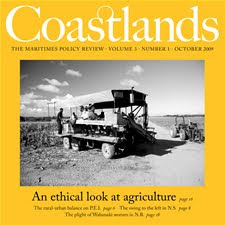 The Advertising Standards Authority told the publisher it was duty bound to issue substitute gifts of an equivalent value after receiving complaints from a customer who signed up to receive 12 issues of the magazine and free toiletries, only to get a notebook in lieu of the advertised gift. The publisher said the notebook sent to the complainant was a limited edition item specifically designed for House and Garden that could retail for substantially more than the toiletries offered. "We acknowledged House and Garden's explanation that the decorator's notebook sent to the complainant as a substitute gift had been sent following a handling error," [said the ASA] but nevertheless considered that, because not all subscribers had received a free gift of equivalent value to the Molton Brown gift advertised, the promotion had not dealt fairly with consumers." 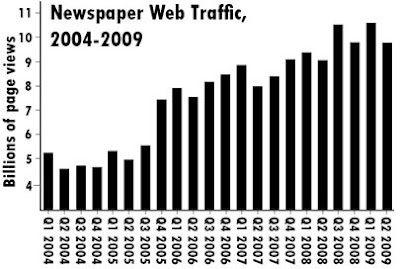 Traffic's up, page views are up, but where's the revenue for newspaper sites? Figures provided by the Newspaper Association of America indicate that there has been a 75% increase in unique audience U.S. newspapers' online sites. Which, says a story from MediaDailyNews, raises the question about whether or how newspapers could capitalize on this "spectacular growth". The story reports that active reach -- the measure of how many U.S. internet users viewed newspaper web sites -- increased from 9.6 billion page views in the first half of 2oo4 to more than 20 billion in the first half of this year. And usage has grown from 39.2 pages per person in 2004 to 47.2 pages per person this year. These figures show that newspapers' online audience has grown faster than the U.S. Internet population at large. The total number of Internet users grew from 204.3 million in the first half of 2004 to 227.6 million in the first half of 2009, an increase of 11.4%.